I have this morning written, as an Islington Councillor, to the Leader and Chief Executive of Islington Council to show my solidarity with young people in Islington participating in the Youth Strike 4 Climate on Friday. With the ever expanding knowledge about the impact of global industrialisation on every part of our lives and life on this planet, it is inspiring and shaming that children and young people can see, so much more clearly than we adults, the urgent need to take action on climate breakdown. Re: ‘Youth Strike 4 Climate’ – a planned school strike in the UK by young people who are demanding action on climate change, Friday 15th February. In particular there is an event in Parliament Square from 11.00 – 2.00. 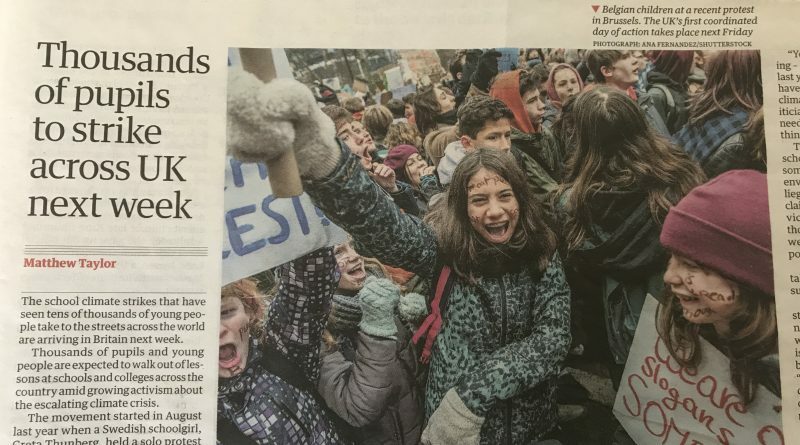 You may have seen coverage in the national press over the weekend as schoolchildren prepare to take part in the first nationwide Youth Strike 4 Climate, with events planned in over 40 towns and cities across the country. The strike is inspired by the actions of 16 year old Greta Thumberg in Sweden, which have resulted in up to 70,000 schoolchildren in 270 towns and cities worldwide taking part in ‘Fridays For Future’. Young people from Brisbane to Brussels are demanding that politicians take action to confront the Climate Emergency. The United Nations IPCC report, late last year, made it clear that we have only 12 years left to limit global warming to a rise of only 1.5 degrees Celsius, the guardrail temperature after which catastrophic climate change impacts are inevitable. Here in London we will see the effects of climate change in increased flood risk, overheating of homes in summer along with the risk of wild fires like the fire on Wanstead Flats in 2018 which threatened to burn down a petrol station and was the biggest wildfire since the formation of the London Fire Brigade. I appreciate this action provides a dilemma for Head Teachers (set out in the Guardian over the weekend). I also anticipate schools will encounter young people asking about the Youth Strike 4 Climate, so I’m writing in the hope that the council can carefully consider any pupil absences as a result of their climate strike action and take into account the exceptional circumstances and the positive learning experience from their citizens’ action and political participation. I hope you agree with me that it is inspiring to see young people respond to the urgent threat, to all our futures, posed by the risk of climate breakdown and that young people in Islington will be enabled to play their part on Friday.